Toyota has been one of the most reliable automobile companies in the industry for some time now. Not only are their sedans some of the most reliable cars on the road, but the trucks in Toyota’s arsenal are at the top of the game as well. The Toyota Tundra is a great reliable truck that can be used for work, towing, and off-roading. The Toyota Tundra has luxurious interiors that allow for passengers to have a smooth and relaxing ride every time. The New Toyota Tundra Rock Warrior boasts a wide array of upgrades from the original Toyota Tundra. Even though the original Toyota Tundra is already a solid reliable truck, the Toyota Tundra Rock Warrior has a set up upgrades that gives your truck that real edge. If you are looking for the next level of pick up truck, then the Toyota Tundra Rock Warrior is the car for you. The Toyota Tundra Rock Warrior boasts a 5.7 Liter V8 engine which displaces over 380 Horse Power. This gives the driver 400 pounds of torque, with a 6 speed automatic transmission. The Tundra Rock Warrior model has 17 inch TRD wheels, with all terrain tires to match. These wheels and tires, paired with 4 wheel drive, make for an extremely enjoyable off road experience. The Blistein shocks on the Toyota Tundra Rock Warrior also allow for a smooth ride, whether on the free way, or on dirt roads. 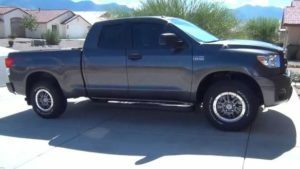 The Toyota Tundra Rock Warrior is a great alternative to the original Toyota Tundra. The upgraded interior, suspension, wheel base, and engine, allow the driver to have an experience that is comparable to other pick up trucks. This truck is perfect for those who really do need the top of the line. No other truck in the market has quite what the Toyota Trundra Rock Warrior does. TDR has been making great upgrades in the toyota industry for many years now. The TDR brand is one that can be trusted, and their products never cease to amaze. With the Toyota Tundra Rock Warrior, you can be assured that your experience will be top of the line!